WASHINGTON, Nov 11 2014 (IPS) - For the third year in a row, government negotiators for 12 Pacific Rim countries have missed an internal deadline to reach agreement on a controversial U.S.-led trade deal. And though negotiators for the accord, known as the Trans Pacific Partnership (TPP), say the process is nearing completion, critics of the deal are expressing optimism that both public opinion and political timing are increasingly against the deal. “The reason the Obama administration keeps missing deadline after deadline, year after year, is that it’s pushing an extremely unpopular agenda that benefits a handful of big corporations at the expense of the economy, environment and public health in each TPP country and beyond,” Arthur Stamoulis, executive director of the Citizens Trade Campaign, an advocacy group that opposes the TPP, told IPS. 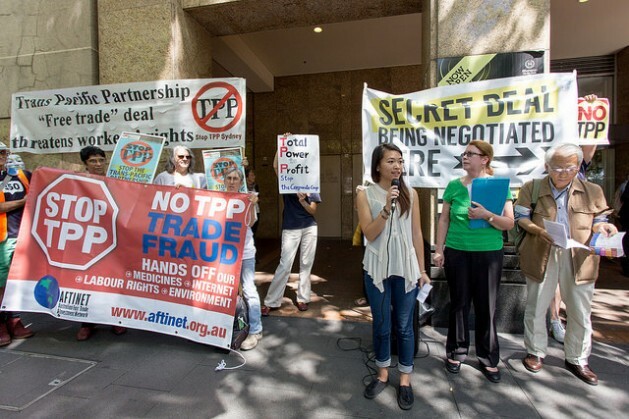 TPP negotiators confirmed the news on Monday at a regional summit in Beijing. President Barack Obama’s administration, which has been spearheading the TPP talks, had set the meeting of the Asia-Pacific Economic Cooperation (APEC) grouping as a key target for agreement. President Obama has made the TPP a central part of his attempt to reorient the United States towards Asia – and to economically circumscribe China, which isn’t party to the talks. On Monday, the president himself was in Beijing, where he acknowledged that the TPP process now needed additional political pressure. “During the past few weeks, our teams have made good progress in resolving several outstanding issues regarding a potential agreement. Today is an opportunity at the political level for us to break some remaining logjams,” the president told trade ministers in Beijing. The president said the TPP talks have the possibility of resulting in a “historic achievement”. A statement released by the 12 countries party to the talks suggested that “the end” of the negotiations is “coming into focus”. Yet disagreements remain, with media reports pointing to agricultural protectionism as proving to be particularly thorny. Others say that substantive frustration remains over a raft of disparate issues, many far from traditional trade concerns – including environmental impact, labour safeguards, medicinal pricing, patent rules and investors’ ability to circumvent national law, among other concerns. In many ways, it is the broad scope of issues on which the TPP touches that is responsible for strengthening public concern. Now, with President Obama down to his final two years in office, critics are increasingly confident in their ability to stave off agreement. With the U.S. 2016 president elections likely to heat up as early as the middle of next year, passage of any major trade agreement by U.S. lawmakers would be improbable until 2017 at the earliest. Last week’s national election here in the U.S. did change the discussion around one issue that would be key for any eventual TPP agreement: whether President Obama is allowed to negotiate unilaterally, or whether he would need Congress’s point-by-point approval of a proposed accord. Because trade agreements typically touch on so many domestically sensitive issues, U.S. presidents in the past have asked for approval to negotiate without input from lawmakers. Such “fast track” authorities then allow Congress only a single up-or-down vote at the end of the process. Yet due to concern among U.S. constituents over the potential impact of the TPP on the domestic economy, both houses of the U.S. Congress has been reluctant to approve President Obama’s requests for these authorities. Still, last week’s election some have suggested that this could change. The issue could now come down to a debate that is taking place within the Republican Party, which increased its majority in the House of Representatives and in January will take over control of the Senate. Yet while the House has consistently opposed passage of fast track authorities for President Obama, the new Republican Senate leadership has suggested that such legislation could now be a key priority early next year. “Most of [President Obama’s] party is unenthusiastic about international trade. We think it’s good for America,” Mitch McConnell, the top Republican in the Senate and the figure who will set the body’s agenda this coming year, said at a press conference following last week’s election. The new potential movement on fast track authorities has sparked a furious debate among conservatives, particularly between those who have traditionally supported big business and those increasingly concerned about globalisation’s impact on U.S. workers. This division has strengthened since the 2008 economic downturn. “It’s only in the past few years that we’ve seen a small cabal of internationalist, Big Business-allied Republicans emerge, and it is this corporatist wing that has pushed for free trade,” Curtis Ellis, a spokesperson with the American Jobs Alliance and executive director of ObamaTrade.com, a conservative watchdog site, told IPS. Indeed, of the TPP’s 29 proposed chapters, just five deal directly with trade, according to Public Citizen, a consumer interest group here. “[T]he non-trade provisions would promote lower wages, higher medicine prices, more unsafe imported food, and new rights for foreign investors to demand payments from national treasuries over domestic laws they believe undermine the new TPP privileges they would gain,” Lori Wallach, the head of the group’s Global Trade Watch programme, said Monday.